Underlying all our B2C data marketing solutions is dbsLifebase, our consumer marketing universe that underpins the successful delivery of all our marketing campaigns. Not only do we have a range of solutions for offline marketing, our data universe can now be used to build digital audiences for standalone digital and social targeting, or combined for effective multi-channel marketing campaigns. 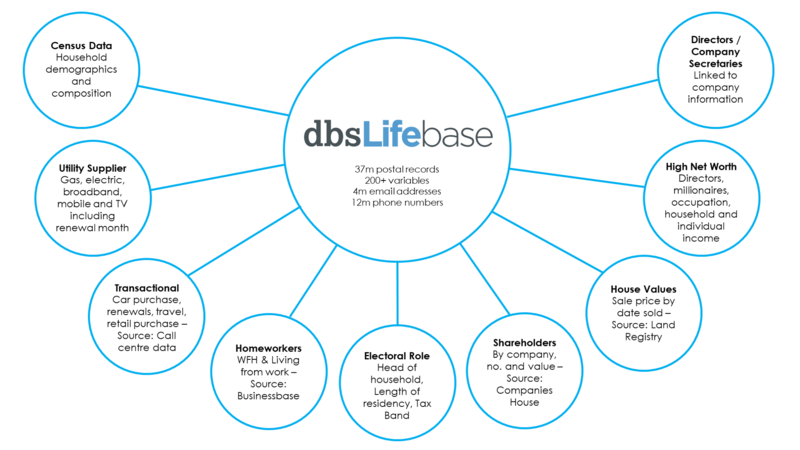 Our B2C Data Universe, dbsLifebase, holds insight for more than 37 million UK individuals in 21 million households, combined from a range of compliant sources. Every record is enhanced with information to the highest levels of quality, detail and compliance. dbsLifebase provides B2C marketing data that is available to support your customer acquisition strategy for direct mailing, telephone or email marketing and can also be used to enrich your customer insight with over 200 variables. Our marketing data compliance policies ensure that every record strictly complies with ICO code, the DMA code of practice and the EU Electronic Communications Act and the EU GDPR regulation. You can be conﬁdent that any data you acquire from us is the most compliant available in the UK today and carries our quality guarantees. But the most important thing about our B2C consumer data is the expertise within our team. Our expert direct marketeers ensure that your exact data requirements are met. However difficult, different or complex they are, we are here to help you get exactly the data you need. We guarantee that the data you buy from our B2C data universe will deliver you with the most successful intelligent sales and marketing campaigns with excellent results.